Pygeum has long been known for its curative properties, and is a popular herb to treat certain male health problems. Pygeum has been recognized in its native Africa for many centuries, owing to its immense medicinal value. It has only somewhat recently been discovered by Europe and is now a popular medicinal herb in the region. Reducing the severity of BPH. modern uses of the plant mainly focus on its effectiveness at reducing the symptoms of benign prostatic hyperplasia (BPH), which is the medical term for the non-cancerous enlargement of the prostate. Preventing urinary tract disorders. Due to its anti-inflammatory properties, pygeum is often taken as a supplement for urinary tract health support. The main compounds behind pygeum's health properties are phytosterols and pentacyclic triterpenoids. These are responsible for the anti-inflammatory and anti-edema properties that are thought to be the main reasons this plant is used for curing the symptoms of BPH. Significant compounds that contribute to the benefits of pygeum are tannins, amygdalin, and cyanogenic glycoside. Pygeum's phytosterol beta-sitosterol is found in various plants and works by hindering the synthesis of prostaglandins, thus resulting in reduced inflammation. Studies have shown lower levels of prostaglandins in BPH patients who have been administered beta-sitosterol. The pentacyclic triterpenoids also help prevent inflammation by obstructing activity of the enzymes. They are effective anti-edema agents and also help increase the integrity of small veins and capillaries. Anti-inflammatory herbs that reduce edema and are beneficial for prostate health are saw palmetto and nettle. Pygeum is commonly regarded as generally safe, although some men may experience mild digestive problems, such as stomach upset, nausea, and diarrhea, after consuming the herb. Pygeum has not been reported to interact with any other medication or supplement. It is commonly taken in combination with saw palmetto fort the treatment of benign prostatic hyperplasia; however, overharvesting has put pygeum on the verge of becoming an endangered species. Nowadays, herbalist recommend the use of pygeum only when other herbs haven't worked. Pygeum is rarely taken by women; there are no data of its effects during pregnancy and lactation. Pygeum uses, both traditional and modern, are primarily restricted to herbal remedies made from the bark. Aside from the berries of the pygeum tree being eaten by gorillas and some birds, there is virtually no culinary applications for pygeum. Infusion. The dried pygeum bark can be stepped in hot water for few minutes. This preparation can be taken on daily basis for treating urinary problems and promoting prostate health. Decoction. A concentrated preparation is obtained by boiling the pygeum bark with water. This liquid can be taken every day to reap the anti-inflammatory benefits of the herb. Liquid extract. This strong preparation concentrates all the medicinal benefits of pygeum. Few drops are diluted in a glass of water for a potent anti-inflammatory effect. Capsules. In this supplemental form, pygeum can be taken every day, in standardized doses, for a more controlled anti-inflammatory action and urinary tract health support. Pygeum is ubiquitous year-round in most of Europe, though it is more popular in some countries. Fresh pygeum cannot be easily purchased in Western countries, but pygeum tea can be found in some specialized health stores. Some specialized health stores offer pygeum remedial forms; however, Online retailers carry a wide selection of brands and concentrations of pygeum liquid extracts and capsules to suit individual needs. Pygeum trees are mostly confined to tropical climates, and their natural population has been damaged by overharvesting, putting this exotic species on the verge of extinction. Pygeum grows best in moist environments and humid semi-highlands, at altitudes of 2625 feet (800 m) above sea level and higher. Sandy loam soils, well-drained, moist, and nutrient-rich, are necessary for proper germination and growth of pygeum plants. Pygeum adapts well if planted alongside coffee and cacao, which can also be harvested sooner and produce revenue until pygeum is ready to harvest. The seeds for planting are extracted from the mature fruits by rubbing them with sand to remove the pulp. Pygeum can also be propagated by taking leafy stem cuttings from plants with healthy and vigorous shoots. To stimulate growth, 50 grams of a general purpose fertilizer can be applied to the soil around the pygeum tree a month after planting. Pruning the lower branches from the trunk of saplings can facilitate later bark harvesting. It is important to consider that it will take 15 to 25 years for pygeum trees to grow before their bark is ready to be harvested. The fruits of the pygeum trees are commonly eaten by rats, primates, and birds. As part of recent preservation efforts, pygeum trees have been favored as part of agroforestry programs and as an alternative for reforestation. Pygeum is a native African evergreen tree that grows up to 120 feet (35 m). The oblong leaves are glossy and dark green in color, and have minute serrations along the edges. It bears small white flowers in elongated clusters that are then followed by reddish-brown berries, which are usually around 0.4 inches (10 mm) in diameter. A member of the Rosaceae or rose family, pygeum is also classified into the Prunus genus, which includes innumerable species of flowering plants, some of them of great economical and medicinal value, such as apple (Malus domestica), blackberry (Rubus fruticosus), blackthorn (Prunus spinosa), cherry (Prunus spp. ), and pear (Pyrus communis). Botanists have not identified any distinct subspecies or varieties of pygeum. The pygeum tree was previously known as Pygeum africanum, but has been re-christened Prunus africana, so information about pygeum can be found under both names. 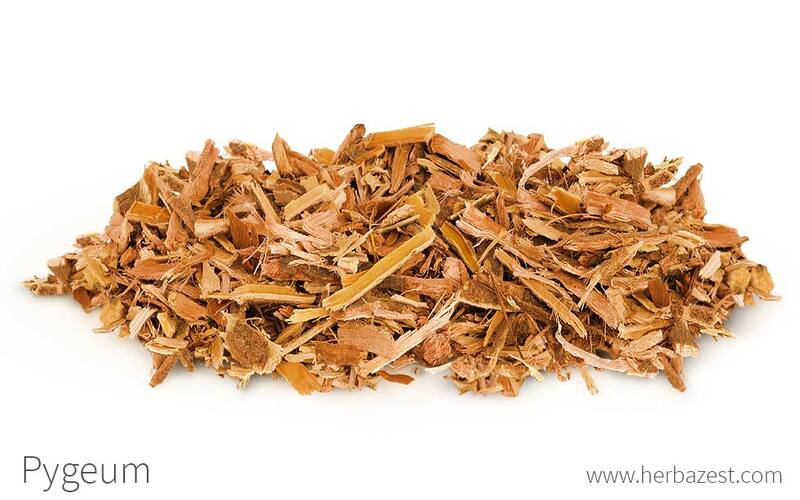 The history of pygeum is mainly medicinal, with bark decoctions having been used in traditional African medicine as a cure for male health problems, including infertility, impotence, and enlarged prostate. It was not introduced to the Western herbal medicine world until the late 1800s. In the last 20 years, the pygeum market has seen a massive increase, and this large-scale harvesting of trees has driven the wild plant to be classified as vulnerable - that is, to the brink of endangerment unless the circumstances around its reproduction improve considerably. The pygeum tree has been intensively farmed for the European pharmaceutical industry, and because wild pygeum is becoming rarer, a commercial farming industry has been developed for pygeum trading. In France, the bark extract is particularly popular, and pygeum products are normally prescribed over surgery for BPH. Pygeum is nearly endangered due to its slow growth rate and extensive use in the pharmaceutical industry. Environmental. Planting pygeum on steep slopes has become a useful practice for reforestation, as well as for reduction of soil erosion and landslides. Ecological. The pygeum tree is an important source of pollen and nectar for bees and other insects, and its fruits are eaten by rodents, birds and mammals, many of which are only found in mountain forests.